Atlas of the Anatomy of Dolphins and Whales is a detailed, fully illustrated atlas on the anatomy and morphology of toothed and whalebone whales. The book provides basic knowledge on anatomical structures, in particular, soft tissues, and functions as a standalone reference work for dissecting rooms and labs, and for those sampling stranded and by-caught dolphins in the field. As a companion and supplement to Anatomy of Dolphins: Insights into Body Structure and Function, this atlas will be of great interest to the scientific community, including veterinarians and biologists, as a book of reference. With a modern approach to dolphin anatomy and morphology, this atlas provides the extensive knowledge necessary to practitioners and theoretical scientists such as evolutionary biologists. 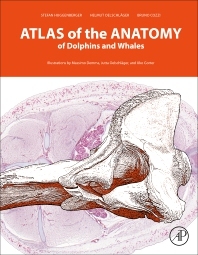 The conceptual clarity, precision, and comprehensive and updated display of the topographical anatomy of the body of cetaceans in the atlas support and illustrate the authors’ related work, serving as a comprehensive reference for those who are more specifically interested in the details of the anatomy and morphology of porpoises, dolphins and whales. Stefan Huggenberger studied in Cologne (Germany) and graduated with the diploma in Biology on morphological aspects of the harbor porpoise population in the Baltic Sea. Since 1999, he performed research on the echolocation system of toothed whales (Ph.D. in Biology). Next to several scientific articles he published chapters in German text books about whales and dolphins illustrated with high-quality graphic work. Current scientific projects focus on the neuroanatomy, and physiology of the auditory system in amphibians, rodents, and particularly toothed whales. In 2010, Dr. Huggenberger organized a marine mammal morphology workshop in Stralsund (Germany) which was the intellectual starting line of this book on The Anatomy of Dolphins. Helmut Oelschläger (Dr.rer.nat.) is a senior lecturer, senior scientist and professor in human anatomy. After studying biology and chemistry in Tübingen (Germany) he made his Ph.D. and habilitation in Frankfurt am Main. He received several scientific awards and organized two marine mammal workshops (Kyoto and Tokyo 2000, Frankfurt 2001). Prof. Oelschläger is an experienced morphologist and neurobiologist and received numerous grants. Scientific topics are: the terminal nerve, magnetic orientation in mammals and the structure of the mammalian head and nervous system (sensory organs, brainstem, neocortex, ontogenetic development). His main focus lies on the comparative neurobiology and the evolution of whales and dolphins. Bruno Cozzi obtained his degree in Veterinary Medicine (Dr. Med.Vet.) with honors in 1980 from the Faculty of Veterinary Medicine at the University of Milan (Italy) and his Ph.D. degree in 1993 from the Faculty of Health Sciences at the University of Copenhagen (Denmark). In 1999 he was appointed full professor of veterinary anatomy at the University of Padova (Italy). His scientific production is focused mainly on comparative neuroendocrinology and neuroanatomy of large domestic herbivores, marine mammals, and man. In 2002 he founded the Mediterranean marine mammal tissue Bank. There is no other book in comparison. A must have for every marine mammal scientist or scientist in training who is working in any aspect of gross pathology or anatomy and physiology.